Having just acquired a Yamaha PSR310, a thought occured to me. Take two 61 note electronic keyboards and you have a simple two manual organ. The keyboards do not need to be the same, and you could use ones with fewer keys, but they do need to be full size. You can get these at a reasonable price on e-bay. You need a simple wooden stand to place them in. You could add a commercial pedal board, if you can find one. Rowland do one, the PK25, but it is designed to interface with their own organ. It might work with another keyboard that had Midi-in. You could build your own using a Midi pedal encoder from Sound Research, but you would need a midi device to produce the sound. Another option would be to build your own, using simple ‘contact when pressed’ sprung switches, and hard wire these to the key contacts on a cheapo keyboard. This needn’t have full size keys, the noddy kids ones would do, provided it can produce decent bass sounds. 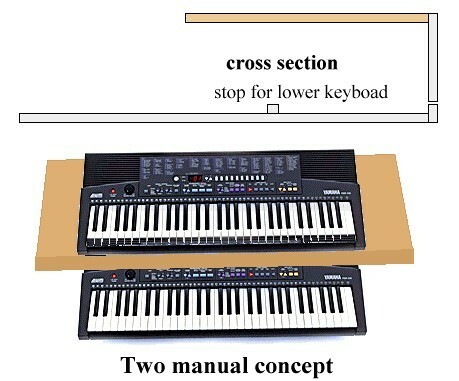 The PSR210 can play two voices on the one keyboard, using the split facility. I have managed "Ich Ruff zu Dir" using this, but it is hard to balance the sound. Other pieces where the hands cross will not work, two separate manuals are required. This is a bit basic, and it is difficult to quickly change stops (voices) on the PSR210. For baroque music it could do though, as you can play through a piece on one registration. To get the functionality of the draw stops and registration change buttons on a real organ, you would need keyboards that would accept commands through an electronic interface, and build a control box to submit these. It is all getting a bit complicated, so if you are going to go that far, you may as well build a full organ, like these guys have. M Wandel home built pipe organ, single manual. Raphi Giangiulio’s Pipe Organ, single manual and pedals, 5 stops. Andy Nelson 37 note positive organ nearing completion.